In this video you can see a welded seam being pulled apart immediately after welding, and it does not break. It means that your roof will always stay water-tight and leaks free. 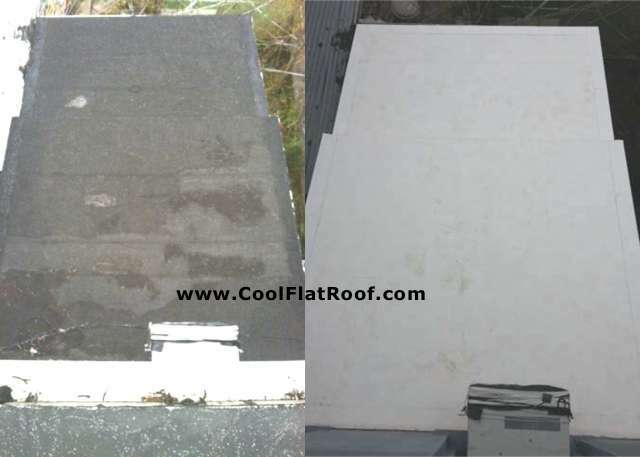 This is the Cool Flat Roof difference! Old glass dome skylights on this roof were leaking, and glass was cracked in many places. We took the old domes apart, custom fabricated new wire-reinforced glass and built a new aluminum frame in place of the old one. 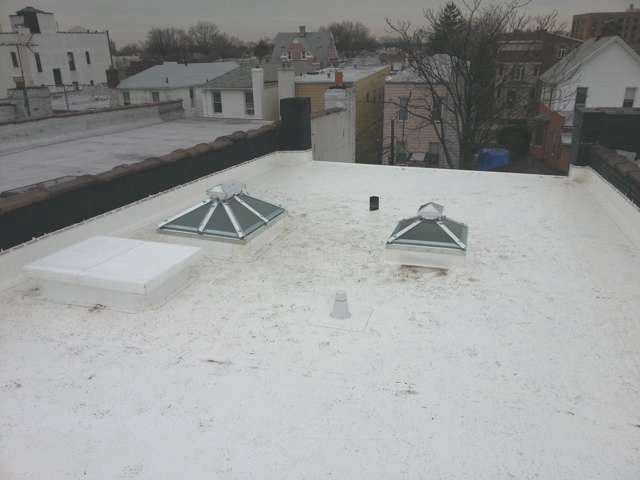 Once assembly was complete, we flashed skylight curbs with IB membrane, and IB pre-fabricated outside corner flashing accessories, that were hot-air welded in place to provide lifetime leaks – free flashing at the base of skylights. On top of new skylights, we custom-fabricated welded aluminum caps, to ensure the top of each skylight is water-tight. The old roof hatch was a rusted tin covered wood door. The hatch curb was basically a wooden frame covered in tar, to prevent water from going inside. We wrapped the hatch cover and hatch curb with IB membrane, and welded IB outside corner flashings at the base of the curb to make it water-tight and give it a nice, clean look, consistent with the rest of the roof. A separation wall is an artificial structure on the roof, made to physically separate roofs from each other. This helps individual roof / condo owners to identify whose roof is leaking and to make sure that a neighbor’s roof is not affected during roof installation or repair. However, the separation wall can often be a source of leaks itself. Often, a heavy clay tile set in mortar covers the separation wall, and the roof is terminated under the tiles. To make sure that our roof is leak free, we ran an IB membrane up the separation wall, sealed it to the wall with IB Water Stop sealant, and attached it to the wall with aluminum termination bar and masonry anchors. This will ensure that flashing stays in place in water does not get behind it, even when there is over a foot of snow on the roof. This flat roof replacement job also had a small entrance roof on the back of the house. Originally, it was covered with rolled asphalt roofing. As part of the installation, we also replaced the lower roof, so that all flat roof sections on this house had a new, Lifetime IB PVC membrane, giving it years of leaks-free protection. 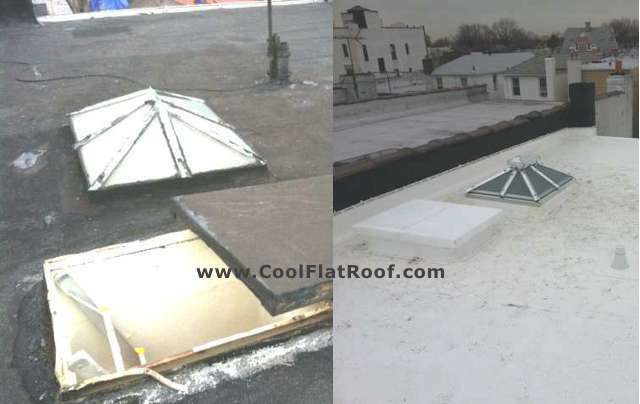 If you live anywhere in New York State, NYC, or Long Island, and have problems with your flat (or sloped) roof, Cool Flat Roof is the best contractor for the job. Contact us to get a free roof replacement quote in NY. To get a free roofing estimate, please call us at 617-444-9020 or fill out our NY free roofing estimate form. 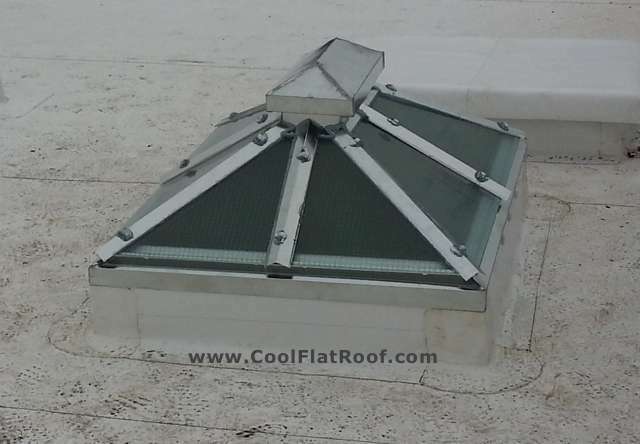 Cool Flat Roof PORTFOLIO – see some of the roofs that we’ve installed in NY, CT, MA and RI. Flat Roof Repair guide for homeowners – information on problems, options and solutions for a leaking flat roof. This guide includes many questions and answers for homeowners with flat roof problems. Why you should AVOID Rubber Roofing – learn about the problems associated with EPDM rubber roofing, contractors installing rubber membranes, and why you should stay away from this cheap alternative.